Watching the racing at home or on a racecourse? 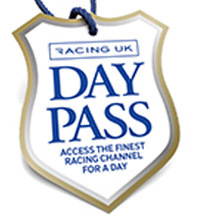 Together with Racing UK, we are offering you the chance to collect and spend your Rewards4Racing points on Racing UK’s products and services, including their all new Day Pass. Racing UK is the leading horse racing channel and broadcasts every race live from the UK’s 37 best racecourses – now in stunning HD. So whether you want to become a full Racing UK member or would like a one-off Day Pass, you can spend your hard earned points and save money! Note: Unfortunately this offer is not available to Virgin Media customers at this time. We have lots of different offers available to help make your passion for watching racing more affordable. Do you have 500 points? Then why not treat yourself to a free Racing UK Day Pass to watch all the live action from your favourite day of racing! Or, save your points and when you reach 1,200, you can get a whole month of Racing UK Anywhere absolutely free! A Racing UK Day Pass* lets you watch a day’s live horse racing whenever you want, without the commitment of an ongoing contract. You can watch on TV, tablet and mobile. So whether it’s a Wednesday afternoon’s racing at Nottingham or a Saturday at Cheltenham, with the Racing UK Day Pass you can watch all the excitement from that day, whenever you want! Make sure you don’t miss any of the live action by calling 0844 472 5777 to claim the offer of your choice. Are you an existing Racing UK member? Don’t worry, you’re not missing out as we have offers to suit everyone. Call 0844 472 5777 to find out how you can pay for the next month of your membership using your points.